U.S. Marine Corps F/A-18s with Marine Fighter Attack Squadron 232 over the skies of Iraq on July 19, 2015. US Marine Corps photo. 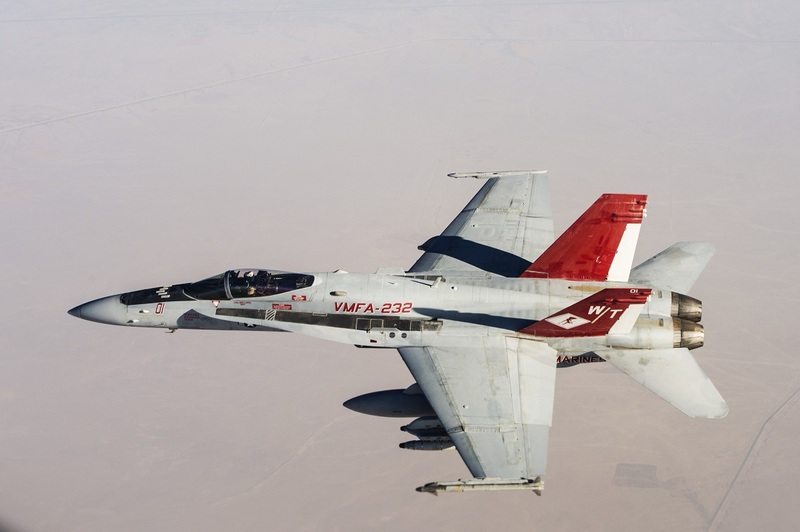 A Navy F/A-18C Hornet pilot assigned to Naval Aviation Warfighting Development Center crashed a jet into an open field near Naval Air Station Fallon, Nevada, yesterday at approximately 10:50 a.m. PDT. The pilot safely ejected and was transported to a local hospital. Initial reports indicate no people or structures on the ground were affected during the mishap, the cause of which is under investigation. The jet itself was on temporary assignment to Strike Fighter Wing Pacific Detachment Fallon, from Marine Strike Fighter Squadron (VMFA) 232. The Naval Aviation Warfighting Development Center is located at Fallon and serves as a tactical air warfare training center. Two other F/A-18C Hornets have crashed this year, both with fatal outcomes for the Marine Corps pilots. Maj. Richard Norton, 36, died July 28 when his jet crashed near Marine Air Ground Combat Center Twentynine Palms in California during a pre-deployment training exercise. And Capt. Jeff Kuss died when his Hornet, the Blue Angels’ #6 aircraft, crashed during a training run ahead of an air show in Tennessee. Last fall, Maj. Taj Sareen, 34, of VMFA 232 also died when his F/A-18C crashed outside the RAF Lakenheath airbase in Great Britain while returning from a six-month deployment to the Middle East as part of the anti-ISIS Operation Inherent Resolve. The jet that crashed yesterday had originally come from that same squadron, but the Navy pilot was not affiliated with VMFA 232.